This post was sponsored by YogaGlo and I was compensated to write this post, but all the opinions are 100% my own. Not too long ago I was introduced to YogaGlo and I’ve become obsessed! YogaGlo is an online subscription platform that brings yoga straight into your living room. I’m not the “at home workout” type, but what I’ve come to appreciate about YogaGlo is that I don’t have to drive to my closest studio to get a really incredible class in. It’s a great way to strengthen your practice if you don’t have the time to make it into a studio, budget is tight, or if you live in an area where your favorite studio is still 25 minutes away #thisisme. 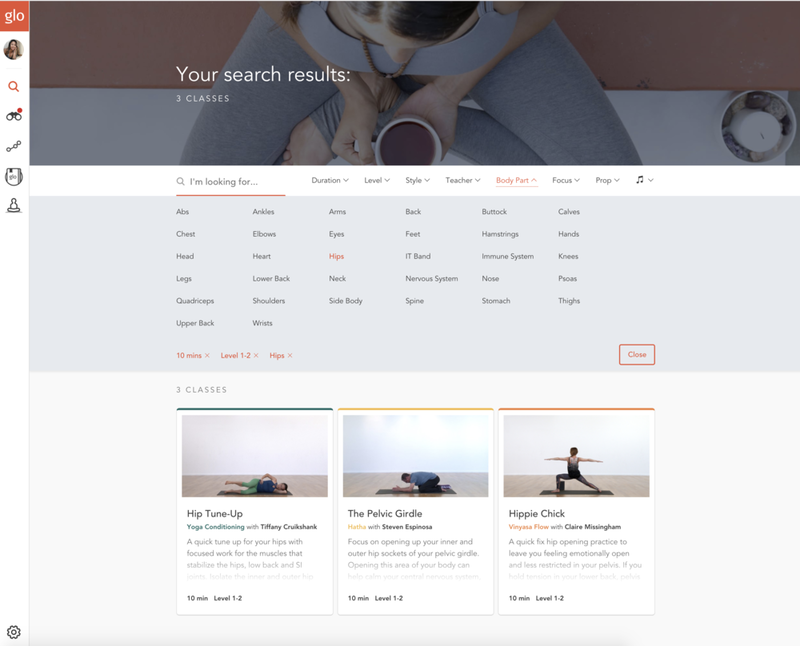 YogaGlo is a health and wellness brand that creates intelligent tools, like yoga and meditation, that challenge people to live a fulfilling life.They even offer a large number of yoga, meditation, pilates and nutrition classes as well as courses that can be applied to the non-contact hours for Yoga Alliance Teacher Trainings. You can learn more here. One of the coolest things I thought about YogaGlo was that the classes were live yoga classes that were filmed in their Santa Monica studio and shared to you. What I love about this is you get to experience the instructor as if you were in class with them. You still feel connected to the teacher even though you’re in your living room. There’s a variety of different classes from Vinyasa, Hatha, Ashtanga, restorative, and Yin. You can also choose the length of your class, the level of practice, and the area of focus or teacher. Duration ranges from 5-120 minutes, to help fit any schedule. YogaGlo did an impressive job of gathering some incredible yoga teachers including Kathryn Budig, Jason Crandall, Chelsey Korus, Tiffany Cruikshank, MC Yogi, and my personal favorite Dice Ida-Klein. I’m pretty obsessed because of the fact that I feel like I’m in a real yoga class when I stream the videos. In some of the classes, you’ll see other students with the teachers, hear or see teachers make mistakes, and there’s some laughter. It just feels human and genuine and I love that about it. What I’ve also come to appreciate with it is that search feature that allows me to customize my practice for that moment. For example, if I want to find a 10 minute, Level 1-2 class that’s focused on hip opening practices, I can search for it. The other thing that I love is the ability to participate in programs (guided class series designed to help meet your wellness goals) that I can follow and schedule based on my needs. I’ve been carving out more time in the morning to meditate and I used YogaGlo’s “I Don’t Meditate” program for it. It’s a great mindfulness practice that takes no more than 10 minutes and is perfect for the person who’s trying to get into meditation without the heavy woo woo fluff. In the month of August I decided to challenge myself to use YogaGlo for 14 days and what I had noticed was that I had more clarity, my breathing and tightness in my chest improved, the pain in my shoulder was going away, and my hips have become looser, thanks Dice Iida-Klein. During the month of September I’d love to get back to the mat a little bit more and deepen my practice. Would you join me on that journey? DOWNLOAD YOGAGLO APP OR SIGN UP FOR A FREE 30 DAY TRIAL. Use the coupon code GOFITJO to get your 30 day trial here. Let's get bendy together.